I love using baker's twine for all sorts of projects and packaging! This fun rainbow set would be really useful for card-making or scrapbooking. Carnival tickets make fun ephemera! These are blank, so your recipient can add their own designs to the tickets if they'd like. Can you tell I'm into rainbow supply sets? :) These shipping tags would be great project bases, for gift tags, bookmarks, or other paper projects. If you saw my Sweet Life Coaster Set project, you probably know how obsessed I am with Jenny and Aaron's work. I have this book of theirs, containing all sorts of mixed media projects, many of them involving paper techniques. It's seriously awesome - I've tried out a few of the techniques I learned from the book in my projects! 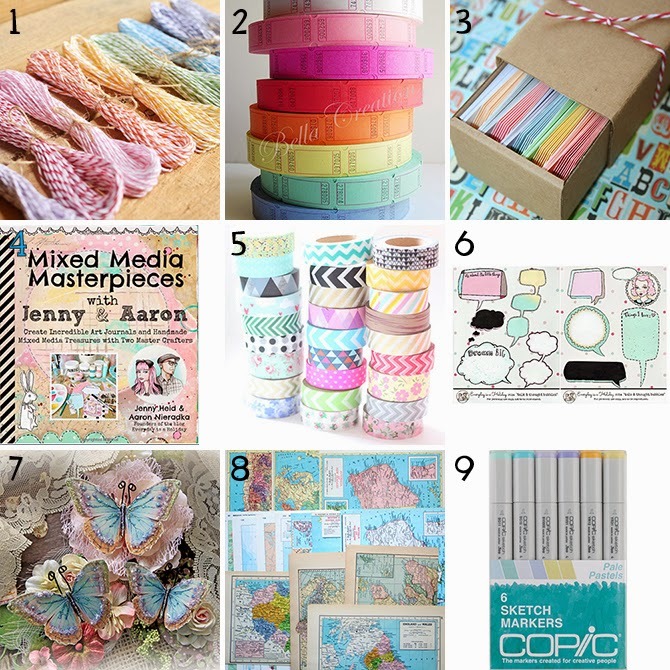 Every paper crafter loves washi tape. Pretty sure it's a rule of the universe. This set is a pretty good deal! See 4 above! Heh. More Jenny & Aaron goodies - these thought bubble stickers would be fun for card-making, scrapbooking, or art journaling. Renea sells trios of gorgeous, handmade butterfly and dragonfly scrapbook adornments in every color imaginable. They're beautifully detailed, with German glitter glass embellishments and wire antennae. I can imagine about a million uses for these vintage map pages and I bet your favorite paper crafter can too! These are basically the ultimate dream markers for anyone who's serious about their illustrations. A lot of card makers like to get digi-stamps (kinda like coloring pages) and color them in beautifully with copic markers. Ahhh I want one of everything! Ooh I'm excited to see your kawaii lover gift guide... I'm sure I'm going to faint from all the cuteness!